The impression left on me (and hundreds of thousands of my geeky peers) by Dungeons & Dragons was indelible. Ironically — given all of the Satanist paranoia at the time — D&D was my salvation from the soulless suburban wasteland where I spent my teen years; it not only inspired my friends and me to heights of imaginative collaboration, it empowered me to be a creative person. Without Gygax & Arneson’s strange vision, and the love of games and improvisational storytelling that it instilled, I wouldn’t be anywhere near the cartoonist I am today (for whatever that’s worth). Perhaps the most indelible aspect of all those books and modules was the art. Every image in the AD&D publications that I owned in the 1980s — especially the Monster Manual — is etched into my brain. In a fit of nostalgia after Gygax’s recent passing, having not looked at the TSR library since I left home for college in 1987, I bought all the old rule books off of Ebay so I could run some of my students through the Steading of the Hill Giant Chief. Leafing through these tomes was like looking through an old yearbook filled with the scrawlings of a madman: page after page of familiar faces surrounded by Gygax’s strangely antique prose and table after possibility-laden table. Those familiar faces, though — the Owl Bear, the Mind Flayer, the Catoblepas — are the things that have never left my head. Whether it’s one of the amateurish, Peechee-worthy dragon portraits of David C. Sutherland III, or the definitive renditions of Cthulhu creatures by Erol Otus, the summary of Armor Class, Hit Dice, and No. Appearing might as well read, “Have a great summer vacation! K.I.T. !” I love all of these old drawings, without exception, and didn’t realize how much I had missed them. I love them all, but some more than others, and the best ones are all by the same guy. David A. Trampier, who signed his drawings either “DAT” or “Tramp,” was far and away the most talented of all of the artists who ever worked for TSR. His pen-and-ink drawings were fully-formed and beautifully precise, as if the imaginary creatures and scenes they depicted had a long visual history, when in fact they were being realized on paper for the first time by his hand. Sure, there had been folk renditions of the Rakshasa, the Ki-Rin, and the Minotaur, but in Trampier’s hands they took on an archetypal solidity, and he made real such fits of Gary Gygax’s imagination as the Ankheg, Black Pudding, Intellect Devourer, and Thought Eater. Intellect Devourer and Thought Eater? Gary, do we really need two monsters that dine on psychic energy? Well, if the Tramp is drawing them I’m not going to complain, especially if one is a quadrupedal glowing brain and the other is “a sickly gray, skeletal-bodied, enormous headed platypus to those who are able to observe it.” Thank you, David Trampier, for being able to observe it. Left to right: Basilisk, Wererats, Medusa, Fire Giant (click for larger image). Trampier dropped out of the gaming scene in 1988, an event marked by the abrupt halt of “Wormy,” the beloved comic he drew for Dragon magazine. Payments sent to his last known residence were returned unopened, and further investigation revealed that he had moved without leaving a forwarding address. Some presumed him dead, but the great game designer and cartoonist Tom Wham, Trampier’s brother-in-law, believed him to be alive and well and living somewhere in Illinois. The above photo is from a February 15, 2002 article in the Daily Egyptian, the student newspaper of Southern illinois State University. Even without the confirmation of Gygax and Wham, who say that the man pictured is in fact the Tramp, you can tell it’s him: he looks just like one of his drawings. After the article ran, people began tracking him down, but he made it clear that he just wanted to be left alone. For whatever reason, he left the gaming world behind and now wants nothing to do with it, which somehow makes me respect him even more. You probably don’t remember me, but I was the guy who pored over your drawings between classes in the quad, lying on the grass behind my best friend Eric’s house during summer vacation, late at night when I couldn’t sleep because my imagination was running wild with the possibility of imaginary worlds. Thanks for the memories, Tramp. This entry was posted on May 4, 2008 at 3:44 pm and is filed under Comics, Creators & Destroyers, David A. Trampier, Games, RPGs. You can follow any responses to this entry through the RSS 2.0 feed. You can leave a response, or trackback from your own site. Wow — I have been wondering for years what became of Trampier. Thanks for finding that info, Jason. Like you, I’ve got the images of the old Monster Manual etched into my brain, and like you I was always sort of in awe of Trampier’s linework and design sense. I wonder what it’d take to get him to draw again. I’m impressed! I’ve had occasional and fleeting plans to research what happened to him and to Wormy, but something would always distract me from going any deeper than a cursory google search. Does this make him the Salinger of gaming? I’ve been working with Glenn Rahman, creator of Divine Right, on the sixth edition of the game. One of the many improvements will be the restoration of the original mapboard, which hasn’t been published since 1980. 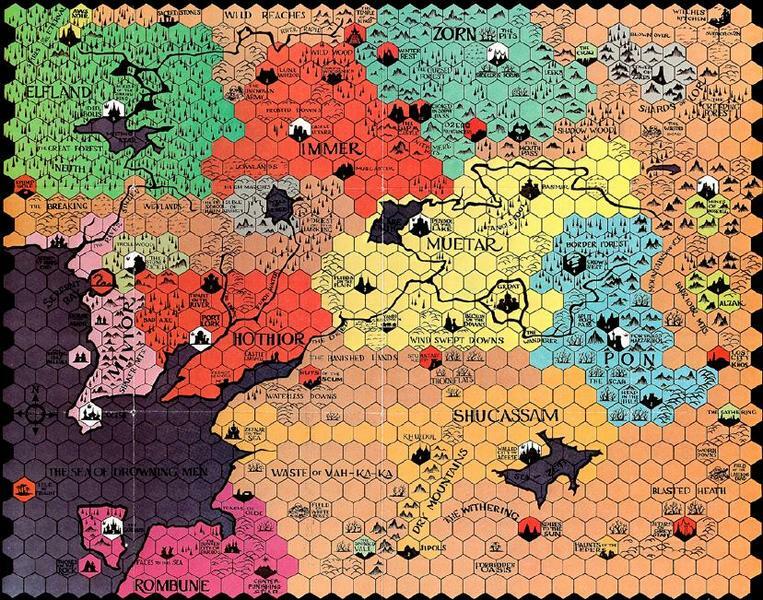 I believe the TSR editions of the Divine Right mapboard is the finest creation of Tramp’s that I’ve ever seen. Great to hear that Divine Right is getting a reprint! Looking forward to seeing that. For those who aren’t familiar with the game, here’s the map in question. DAT’s work had a big impact on me too. I recently picked up a copy of the Monster Manual at a used bookstore. I had no idea that Tampier was also responsible for the Divine Right board. It’s long been one of my favorite game boards ever. Thanks for this post! Thanks for posting this retrospective…like you, I always admired (no, loved!) DAT’s art and placed him in a class of his own (especially compared to the other TSR illustrators, who were certainly enthusiastic but often amateurish). Trampier is also my favorite first generation D&D artist. There were several other excellent talents (especially featured in the first edition Deities & Demigods) … but Tramp was the best. David’s lines were impeccable. His inkwork looked like engravings. He contributed regularly to the spot illustrations in Dragon (besides creating his Wormy strip). David also created a fantastic color collage on the Dungeon Masters screen gatefold. I was dismayed when I found that newspaper article back in 2003 while doing a web search on Trampier. I realized immediately that it was indeed the former TSR staffer, and regret that he didn’t continue his professional artistry. Whatever his reasons, I wish DAT the best … his work helped influence me to the point that I am now a graphic designer. Amen, brother. I carry DAT with me everyday. Yes, thank you so much for your art. It vividly brought so much life to the game. The Wormy cartoon was very cool. I’m still in awe of his line work. He was a huge influence on my inking style. His compositions were flawless. Still have all the old books and when I crack them open the smell of the binding and paper brings back those old days of 8 hour Saturday D&D sessions. Nice post! I absolutely agree..
Nicely said. There will never be another Tramp. I try to imitate his style, but he is the one and only. My goal is to one day hae him see my artwork, which is an homage to his work. Would love to include this in a fan compilation I’ve assembled – please, drop me a line!